The Precision Motorsports Group’s No. 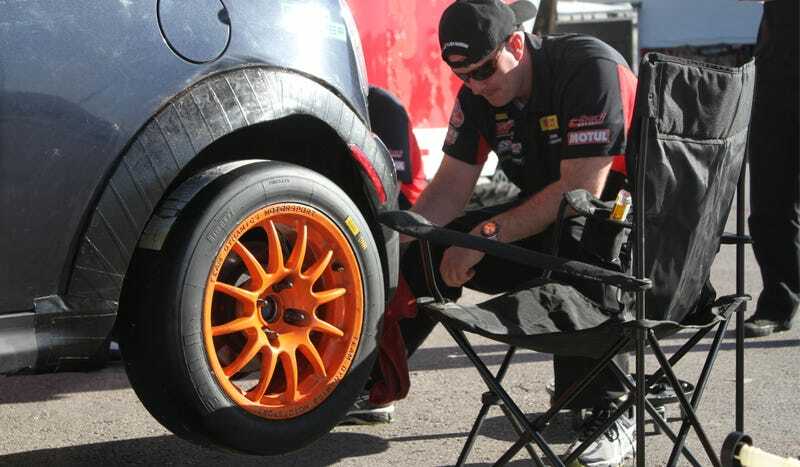 18 Mini Cooper appears to have been through Hell and back when compared to some of the big-budget teams running in Pirelli World Challenge this weekend, and that’s why I love it. Behold, ingenious motorsports fixin’ at work. At speed, the TCB-class Mini Cooper looks downright normal. The repairs to the rear are barely noticeable. Up close, though, it looks like a race car should. The rear fender is all black tape, carefully wrapped around and cut to look like a real, in-tact black plastic Mini fender if you don’t already know to look for something funny on the rear of the car. If anything, it’s less faded than the actual fender. That’s practically an upgrade! When I caught the team setting up for the weekend during the Thursday practice day, they were neatly zip-tying the rear bumper together. This, being a B-Spec car, wasn’t the fastest car all weekend, nor did it land on the podium in either of its races. It was, however, the car I most enjoyed seeing out there. The team mentioned that it was a new car for driver Patrick Wilmot, so what better use for a new car than to throw it right back into racing?